As Secretary of State, Rice would be responsible for the key recommendation to President Barack Obama on lifting the president’s ban on construction of the Keystone XL pipeline imposed in January. She would make the decision knowing that there would be major impact on nearly one third of her (and her husband’s) investments. 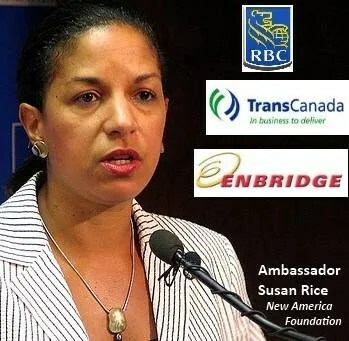 According to her 2011 financial disclosures, “Rice and her husband own at least $1.25 million worth of stock in four of Canada’s eight leading oil producers.” These include Enbridge, the oil company extracting the highly toxic tar sands oil from Alberta, Canada’s boreal forest, which are being destroyed to access the oil (boreal forests sequester carbon). Rice has major holdings between $300,000 and $600,000 in TransCanada Corp, the firm building the Keystone XL pipeline. The pipeline crosses the Canadian border at North Dakota and proceeds through the Midwest on its way to Houston, Texas area refineries. The pipeline crosses over the main source of water for the Midwest, the Ogallala Aquifer. The oil will be shipped to China from Houston to fuel that nation’s voracious energy needs. Rice also has holdings between $5.0 to $11.25 million dollars in the Royal Bank of Canada and lesser Canadian financial institutions funding the tar sands – Keystone XL pipeline enterprises. These three elements form a perfect pyramid of interlocking conflicts. If the U.S. pipeline is not approved, Enbridge, TransCanada, and the Royal Bank of Canada will be stuck with oil that cannot be moved. Canada’s Vancouver, British Columbia port is the logical exit path for the oil for China. However, environmentalists and Canada’s First Nations (aboriginal Canadians) have effectively blocked the Vancouver route. The financiers, the oil companies, and the pipeline companies will be stuck with finding alternate routes after having failed twice to ship their toxic brew. There are two striking concerns that emerge immediately from this situation. Lifting President Obama’s ban on pipeline construction should not be a question open to debate. Tar sands oil is filthy. It will add CO2 to the atmosphere at rates far above levels from current fuels. The situation is so dangerous, leading climate scientist and head of the NASA Goddard Institute for Space Studies, James Hansen described the result as Game over for the climate in a recent New York Times article. Only the most adamant climate change deniers think that use of this oil is anything other than a major detriment to limiting the already damaging effects of climate change. Another concern focuses on the judgment of both President Obama and Ambassador Rice. How could the president, his advisors, and staff overlook this blatant conflict of interest? The material on financial holdings is collected by the federal government. It is used to spot just this type of conflict. Did Obama think he could put Rice up for nomination and have Rice’s stock holdings go unnoticed? Did he think that we would just roll over and trust him on one of the most important decisions he will make regarding our health, safety and livelihood as a nation? The president may have a plan to disapprove pipeline construction before Rice’s nomination is offered or before the anticipated date of approval. If so, he had better disapprove the pipeline quickly or face a very harsh evaluation of his judgment for considering her in the first place. We need a president who will solve problems, not perpetuate them. This is one example of many absurd and totally illogical situations we must endure living in a time of moral and intellectual decadence among the ruling elite. They take what they want because they can and presume they can move through any public objection unscathed. Why shouldn’t they. They get away with this sort of thing all the time. This entry was posted in Energy, Environment and tagged conflict, enbridge, Keystone XL, nomination, rbc, state department, Susan Rice, trans canada. Bookmark the permalink.